Ahh. Life's ironies. Elegant, casual cyclist on a safe, separate bike lane cycles past a poster reading "Put the pedal to the metal and keep it there... Action Night on Channel 3+..."
While skirtguards - or the more unisex 'coat protectors' as we call them in Danish - are a splendid idea, most modern skirts don't really require them. Ironic. But they remain aesthetic additions to any bicycle. Black and Creme Perfection Collection from Lars. Smashing ensemble in classic Copenhagen style. 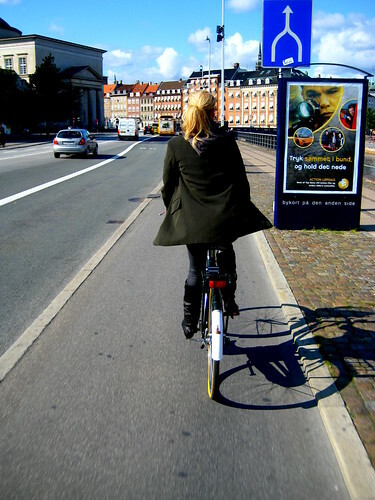 Black outfit and then a creme-coloured; bicycle, bow in her hair, handbag in the basket, shoes, edges of the black bag on the back and a cigarette. 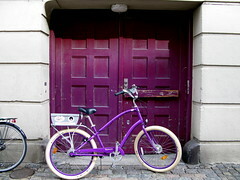 Many of our American readers were curious as to what I thought about riding Yahoo's purple Electra Townie. I must say it's a nice ride. The balloon wheels are a treat, but I'm addicted to them already from riding my Velorbis Scrap Deluxe. The Townie is smooth and comfortable. There are a whole bunch of gears that will never see the light of day but it is definately a cooler bike than I feared they would send. The only thing I don't like is the beach cruiser posture of sitting farther back and pedalling down and away from my body. I like sitting higher up and pushing downwards, but that is personal taste. The purple colour doesn't go with anything I own, but that is something I can live with for the duration of Yahoo's campaign. Also, the beach cruiser is popular at the moment - but mostly among the female 12-16 year old demographic, so I get lots of stares from young girls. Not a bad thing for the male ego. Unfortunately, the camera has a software bug and Yahoo are fedexing a new one over to me so more photos will be on the way shortly. that first pictures is great!!! I don't like the beach cruiser posture either. My old six-speed ladies' Raleigh Sprite (basic black) isn't quite a classic sit-up-and-beg, but almost. My word verification code this time is Stazj. At least it isn't Stasi, but a tad creepy. Love the black and cream ensemble. As a matter of interest, from the fashioista point of view, does the cigarette add to the chic, or detract from it? aaaah. the pleasure of smoking on a bike. so Danish, too! i now crave for a Prince. Purple is alarmingly hot this autumn. So says my Stazj connections. dave: the cigarette is either or. 30-40% of the western world are smokers, so it's not like it's a strange thing. 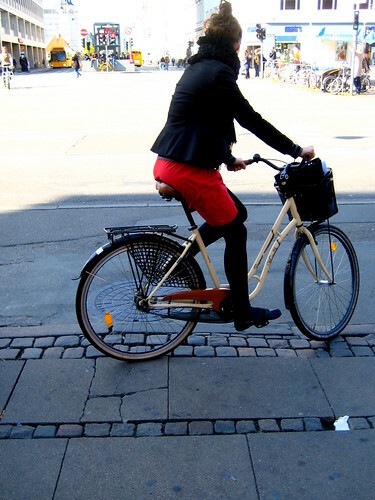 it the eyes of a cycle chic fashionista, however, it's cool because it shows that cycling in european cities is transport. a casual activity that serves a practical purpose.